To whom would you gift a ChallahGram? Anyone: co-worker, employee, boss, partner, vendor, client, neighbor, or relative. On what occasion is a ChallahGram gifted? ChallahGram’s are perfect for an occasion like a friend’s birthday, anniversary, baby naming, or for a “Just Because” gift. ChallahGram’s are really meaningful when they are sent to Hospital’s with a touching “Get Well Wishes” or as a “Congrats”! What is a Wisdom Card? A gift is “the thought that counts.” Every Challahgram comes with an original inspirational quote, authentic Brooklyn Wisdom. The combination of meaning and substance creates a memorable gifting experience. What do people do when they receive such a huge WOW Challah? They share it! Have you ever wondered why sharing a laughable moment turns it into a memorable one? It’s because one smile can be lonely, multiple smiles create memories. 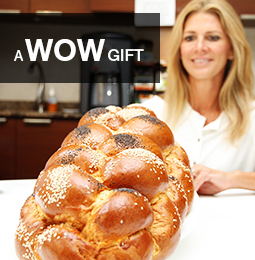 A huge WOW Challah creates a memorable experience! Any tips on wording a powerful gift note? Gifting is all about the “thought that counts”. Here is one tip that will convert the note into a touching experience, perhaps the recipient will even keep the note. Be specific. What made you send this gift? Wishing “happy birthday” is nice, but how many others wish the same? Express how you feel about your friend’s birthday. Take a moment and write a sentence or two that will authentically describe your feelings on paper! What are the ingredients in the challah? Wheat flour, water, eggs, sugar, soybean oil, yeast, salt (processed in a plant using tree nuts, soy, eggs and sesame). All of our Challahs are under the OK Kosher supervision. Will the Challah stay fresh? We take pride in the quality and freshness of our Brooklyn baked Challah. Our carefully selected ingredients, the timing of Challah preparation, and the type of packaging we use, every detail counts and contributes to the great fresh taste of our Challah. We are so confident in our Challah that if you are dissatisfied with the freshness of our Challah, we would be happy to offer you a full credit to ChallahGram.com. We use FedEx shipping and provide tracking numbers as soon as your purchase is picked up by FedEx. Can I specify a shipping address different than my billing address? I have received an error message stating: “Shipping address not verified contact shop owner.” What does this mean? This can mean one of two things: Either the billing address you entered doesn’t match the address on your credit card, or you mistakenly entered the wrong shipping zip code. We recommend you enter the shipping zip code in Google and verify you have the correct zip code. How can I specify a specific delivery date? Before checkout, there is calendar where you can enter the delivery date of your choice. We also offer an Express option. By what day/time do orders need to be in? When selecting a delivery date , please take into consideration that processing time is always a full business day. For example with Express shipping an order placed on Monday will need 1 full day of Tuesday for processing time and it will arrive on Wednesday. With our Free shipping option please allow for three full days of processing time. Do I have to be available to accept my ChallahGram delivery? In most cases, FedEx will release packages if the recipient is not available; however, in some instances that is not possible, for example in apartment buildings or unsafe areas. You may leave a note for FedEx, authorizing them to leave the package at your front door or neighbor. We, on our part, leave a note for FedEx, authorizing them to release the package without a signature. Please see our shipping policy for more information. What time will my ChallahGram arrive?